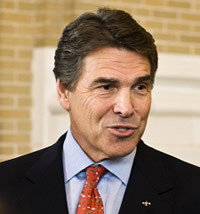 Texas Governor Rick Perry is one of 12 governors opting out or considering opting out of an expansion of Medicaid. Matthew Solis, 22, is a single father in San Juan, Texas, with joint custody of his 4-year-old daughter. He works 25 hours a week for minimum wage while attending college full-time. He can’t afford private insurance, and he makes about $8,700 a year – too much to qualify for Medicaid in his state. The Affordable Care Act (ACA) was supposed to expand Medicaid to cover everyone within 133% of the federal poverty level (like Matthew) by 2014; however, the Supreme Court took away the federal government’s ability to enforce this expansion, allowing states to opt-out. So far, 12 governors have opted-out or are considering doing so, leaving millions of working poor Americans without any access to healthcare. RootsAction and Healthcare-NOW! are teaming up to tell Rick Perry and all the governors refusing to participate in the Medicaid expansion: "Expand Medicaid to 133% of the federal poverty rate." Once we collect 25,000 signatures, single-payer activists in Texas will hand deliver them to Gov. Perry's office. Then we'll work to get the petition to the governors of Arizona, Florida, Iowa, Louisiana, Maine, Mississippi, Missouri, Nebraska, Nevada, New Jersey, South Carolina, Wisconsin, and any other state threatening to opt out. Roots Action and Healthcare-NOW! share a commitment to securing healthcare as a human right under an improved and expanded Medicare-for-all model. Protecting the current expansion of Medicaid is a small but necessary and life-saving step in that direction, as people like Matthew rise up to lead this campaign in every community in the United States. Please add your name now! We urge you not to block the expansion of Medicaid to cover those at 133% of the federal poverty rate or below in your state. This is a matter of life and death.